In the mid 16th century an oblong building the size of a playing field was built on the edge of the little river Brusnice (the riverbed forms the bottom of the Stag Moat). The building, know as the Ball Game Hall, was to provide the court with a place to play an early form of tennis. The Hall has large arcades opening on to the garden, and is covered with architectural decorations known as sgraffito. 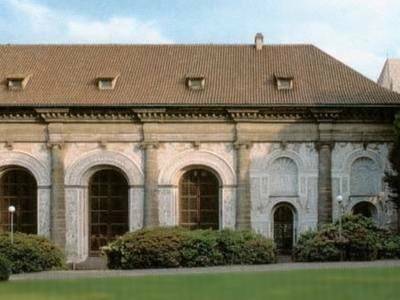 The Ball Game Hall was converted into riding-school in the 17th century, and, after further adaptations, served as a stable. It was later placed at the disposal of the army for use as a storehouse and finally, in the revolutionary year 1848, was converted into barrack for a thousand men. Towards the end of the Second World War the building was struck by a bomb, and burnt down to its peripheral wall, but was faithfully restored. The exhibitions, concerts and social events, for which the building now serves, are an expression of appreciation for its Renaissance beauty. Capacity of the Ball Game Hall in banquet style is 200 people.